It may sound incongruous, but fans old and new of JK Rowling’s legendary Harry Potter series, especially the Warner Brothers films – where super bigoted pretty boy wizard Draco Malfoy graced the girls in the audience with his good looks and gave birth to the “Draco in Leather Pants” trope – are sure to enjoy the upcoming third season of The CW’s hit DC superhero TV series “The Flash”. And that is because Tom Felton, who portrayed Draco in the Potter movies to fan-girl- squealing intensity, is going to be joining the cast as a regularly recurring character. You could say his casting was a tad magical. TVLine reports that Felton will play the part of Julian Dorn, another Crime Scene Investigator for the Central City Police Department and workmate of fellow CSI Barry Allen, aka the Flash (Grant Gustin). Comic Book Resources describes Dorn as an older, geekier associate of Barry’s at work, who begins to harbor suspicions that Barry has been keeping some big secrets, and will likely spend his air time in the season trying to investigate what it is – all while hiding some mysteries of his own. IGN further adds that Felton’s character is going to debut in the earliest episodes of season 3, although whether his first appearance will be in the premiere has yet to be determined. Tom Felton catapulted to fame as Malfoy in all eight Harry Potter films, although his later film roles are more low-key, as in movies like “Rise of the Planet of the Apes” and “The Apparition” and on TV in TNT’s “Murder in the First”.. Season 2 of “The Flash” ended with a traumatized Barry/Flash super-speeding back in time to prevent his mother’s murder. This action triggers the dramatically altered circumstances of season 3, of which the premiere episode will carry the title “Flashpoint”, after a definitive company-wide DC Comics crossover storyline of the same name wherein print-Flash does the same thing as TV-Flash, resulting in an alternate present where his mother is alive and most everything else about the world has been changed beyond recognition. The comics “Flashpoint” also served as a transition to DC’s “New 52” wide- scale story reboot and franchise re-launch. The after-effects of “Flashpoint” remain in all DC comic lines even at present, as the 2016 “DC Rebirth” re-launch initiative is going on. 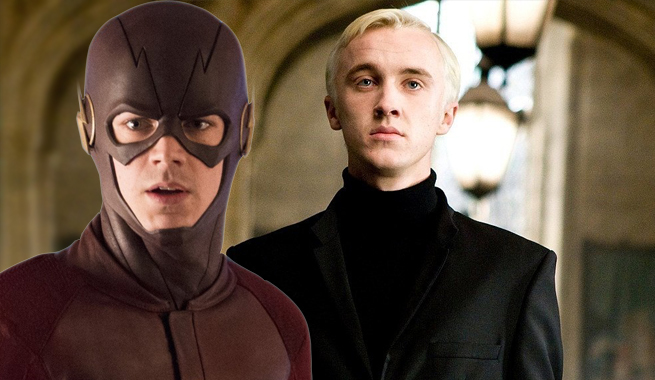 Grant Gustin revealed the “Flashpoint” premiere episode title on Twitter, quickly adding that despite the same name and initial circumstances, the TV series will go its own way and not necessarily ape the comic story’s plot points. “The Flash” and other The CW superhero shows – “Arrow”, “Legends of Tomorrow” and “Supergirl” – will feature later this July at the Sand Diego Comic-Con. Its season 3 will hit The CW later this year, on October 4 at 8 PM EST.